The rapidly expanding restaurant market in Oklahoma City has largely been met with enthusiasm and excitement by those of us who remember when even the opening of a chain restaurant was cause for celebration. And while I’m certainly not here to rain on the new restaurant parade, it is causing at least a few problems. One is a lack of qualified chefs. When high-end spots like Vast are advertising for kitchen help, you know the talent pool is stretched thin. The other is a tendency to forget about the great restaurants that aren’t quite as new and shiny. They haven’t really lost any of their luster, but we’ve let them fall by the wayside a bit. I’m as guilty of this as anyone, especially when it comes to spots that lack the kind of visibility that keeps them front of mind. That’s what’s happened to Kitchen No. 324. 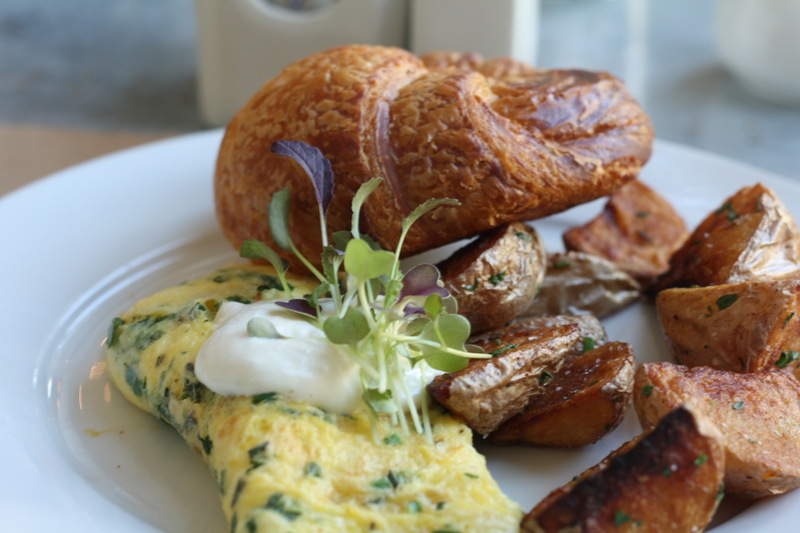 When it opened in 2012, there was no hotter ticket in town than breakfast at Kitchen. Weekends were especially hectic, with wait times frequently stretching over an hour and people actually waiting and not just walking off in a huff. Part of the A Good Egg Dining Group empire, Kitchen No. 324 made brunch-style food the daily norm and presaged spots like Hatch, Aurora and Sunnyside Diner. No longer was a weekday restaurant breakfast confined to a plate of fried eggs with a side of bacon or a short stack of pancakes. It also looked unlike any other daily breakfast joint in the city, with wide open windows bringing in an abundance of natural light, all the better to see the clean lines of the restaurant and the matching uniforms of the staff. Years in and Kitchen is still well loved, but it isn’t everyone’s go-to when you talk about breakfast. Part of that is down to time and the buzz surrounding other, newer restaurants. And part of it is Kitchen’s downtown locale, which is hampered by the near-constant spectre of street construction that haunts every business in the area. 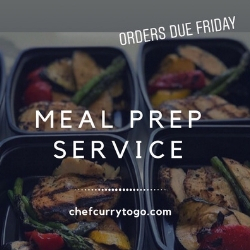 Lately I’ve been making a special effort to get back down to Kitchen and rediscover the dishes that were once the only things Oklahoma City foodies wanted to eat. The first thing that struck me about Kitchen No. 324’s breakfast menu is how much of it has stayed the same. And that’s not a complaint. I can imagine the hue and cry that would go up if the breakfast strata or fried green tomato Benedict were removed. And I would be at the front of the angry mob, with a combination pitchfork/torch, if they ever dare to strike the open-faced toast ($10) from the menu. A simple and simply wonderful creation, open-faced toast begins with a slice of thick toasted bread topped with shaved black forest ham, gruyere cheese, a poached egg and a thyme-infused bechamel sauce. Bechamel, for those who don’t know, is one of the French mother sauces from which many other sauces can be made. I use it when I make macaroni and cheese. Here, the blend of butter, flour and milk creates a pale cloak that hides the other ingredients beneath its richness. Much as I love the Kitchen Green Eggs and Ham, it’s the open-faced toast that other dishes must defeat before I’ll order them. It’s creamy and hearty. It gives me a bad case of the mid-morning naps. If I could curl up under a bechamel blanket, I would. The bacon and monterey jack strata ($9) uses that same bechamel but in a casserole form. Eggs, bacon and cheese are flooded with bechamel before being baked, creating sumptuous layers of rich, fatty flavors. My favorites are the corner pieces, where the cheese has an opportunity to scorch. That burnt, melted cheese is one of my most-prized delicacies. 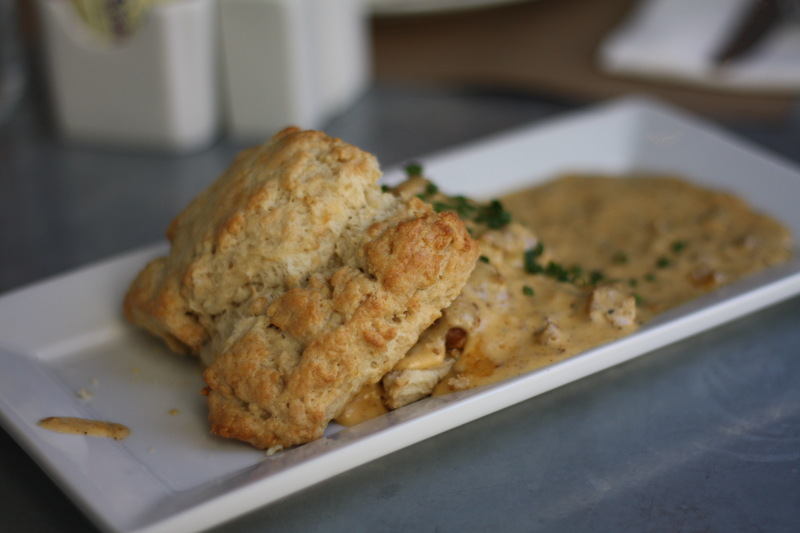 The scratch biscuit with chorizo gravy ($7) is a joy, so long as you understand the nature of Kitchen’s drop biscuits. These have a more crumbly texture — a much more homestyle type of biscuit — that greedily sops up the spiced gravy. Sitting in the middle is a chorizo patty, which adds some spice to the mix, but not so much that you’ll get burned. 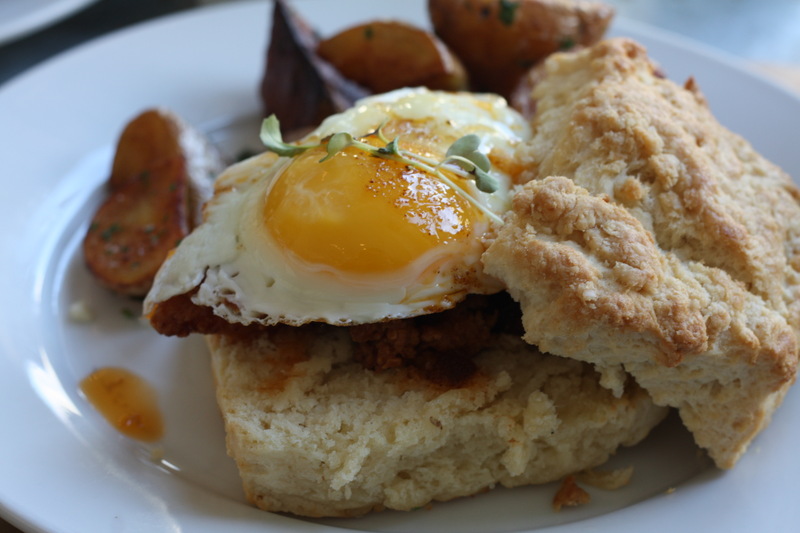 A new addition takes that same biscuit but covers it with hot chicken ($12) and a sunny-side egg. The chicken has a kind of brown sugar crust and a bit of heat from the restaurant’s hot sauce. It’s not quite in line with what I consider “hot chicken,” but it was still tasty. 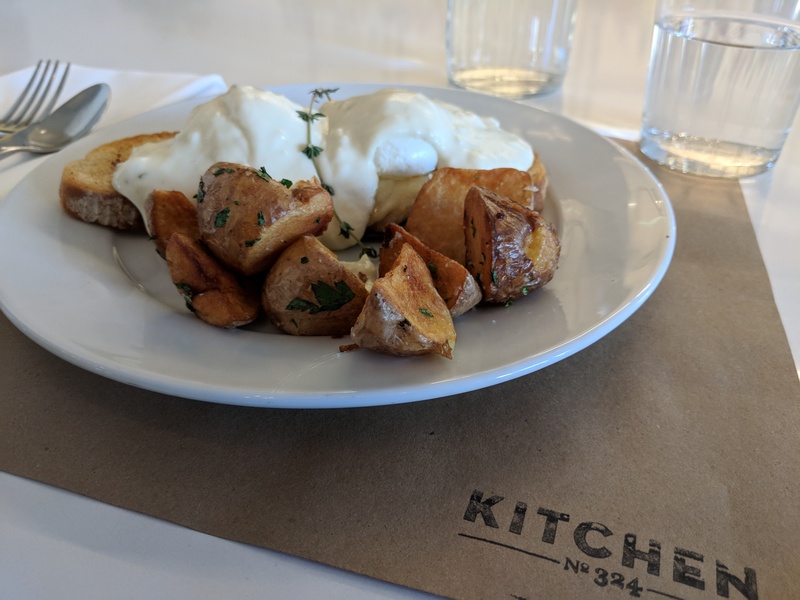 A common complain when Kitchen first opened was that all the eggs were poached (except in the strata), but the addition of some cooking equipment has changed that. I was particularly taken with the simple, straightforward No. 324 Omelet ($9). Other omelets are often stuffed to over-filling with ingredients, but this returns to the dish’s French roots. The eggs are whisked with finely minced herbs, cooked until set and tender, and topped with creme fraiche. It’s elegant and delicious: perfect for someone looking for a classic breakfast. 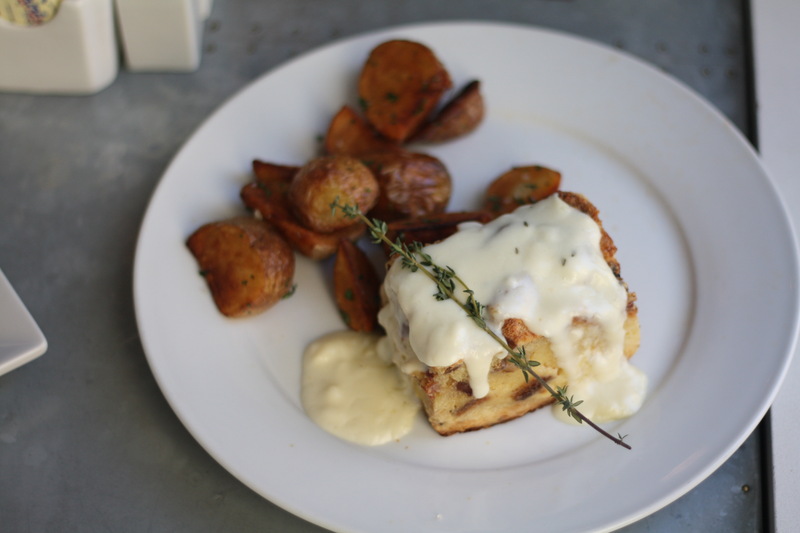 On the side are roasted potatoes and a croissant, so you’re definitely not leaving hungry. If there’s no bacon in your dish, you are hereby ordered to get a side of McCabe’s Small Batch Bacon ($5). Kitchen is no longer the only restaurant in town curing its own bacon, but this stuff is still the gold standard. And that’s a pretty good description for the restaurant, too. Kitchen No. 324 isn’t the only option for a fancy breakfast on the daily, but it’s still serving the kind of food that once inspired legions of foodies to line up. Don’t forget about Kitchen. Maybe when the roads reopen and navigating the area is less a waking nightmare than it is now, I’ll see you there again. I’ll be the guy with bechamel sauce in his beard.